The casualties of Mischa Ransomware say that if you do not pay the ransom in 7 days, the amount doubles. The creators of the malicious program demand around $930 for the decryption of your personal data. However, the fact that all your data is locked and unusable is not your only problem. Apparently, this Trojan manages to modify the Master Boot Record (MBR), which is required to load Windows. This means that you will not be able to use your computer unless you repair the MBR. More instructions will await you at the end of the article, but we must warn you that fixing the MBR is a bad idea, if you want to pay the ransom or wait till someone releases a decryptor. In other words, if you do this it becomes impossible to decrypt your files. Thus, you should repair the system and remove the malware only if you do not plan to make the payment. Users, who do not know much about ransomware infections, should read the whole article and learn how to protect their computers from similar threats in the future. Mainly, Mischa Ransomware should target various companies in Germany, but it appears that it can infect users from different countries too. What’s more, the malware travels with fake PDF attachments through spam email. Again, this shows how important it is to take extra precautions when it comes to suspicious email attachments. Even though such data might look like a harmless text document, you should not open it if it comes from unfamiliar sources or looks suspicious in any way. At times like these, it is also good to have a fully updated antimalware tool as it could stop the infection and remove it from your system. Unlike other ransomware programs, Mischa Ransomware works in disguise, but it is noticeable if you take a closer look. Right after users launch the malicious file their computers restart and the chkdsk scan that you see is fake. Therefore, you should not believe when it says that “One of your disks contains errors and needs to be repaired. This process may take several hours to complete.” This fictitious scan was made to draw you away from your computer while the ransomware encrypts your files. If you plug off your power cable at that moment, you can still stop the process, but once it is completed, there is no turning back. As a result, your files should be locked with the strong RSA 4096 bit and AES 256 bit encryption systems. As we said earlier, Mischa Ransomware overwrites the MBR files to prevent Windows from loading. 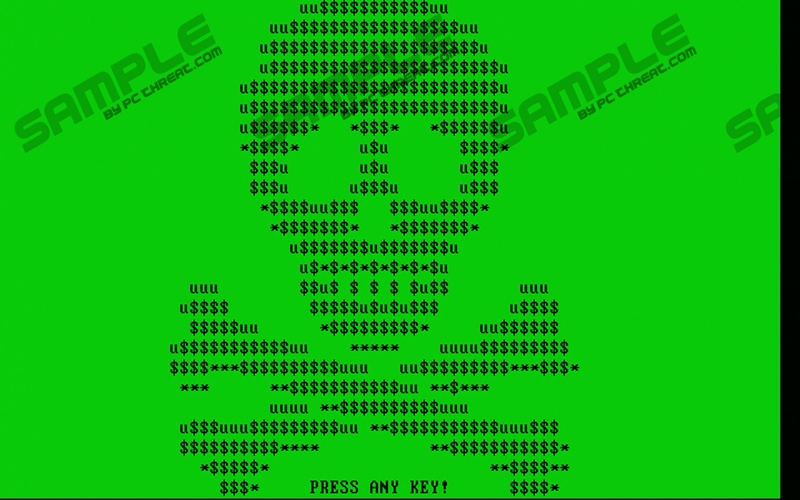 It means that all you can see is a black screen and message from the malware’s publishers. The message informs you about the state of your data and how it is possible to recover it, but the rest of the instructions are available through a particular web page. Of course, if you want to reach it you will have to use another computer. The further instructions explain how to transfer 2.0103 Bitcoins and get the decryption key. However, you should know that the ones behind the ransomware might take your money, but you may not receive the decryption key. Under these circumstances, you should evaluate your data and decide if it is worth the ransom. If you do not have any irreplaceable files, we advise you to remove the malware and fix the system, since it is the only way to use your computer again. The process might take some time because it is not that simple. Firstly, you will have to repair the MBR with the instructions below the article. Then you have two choices: either you reinstall your current Windows version, or you locate the malicious files associated with the Mischa Ransomware. The first option will get rid of the malware and give you a clean start. The second option is more complicated as you will have to look for the malicious file that you launched. If you choose the second option, do not forget to check the %TEMP% directory for possible copies of the malicious file. Whatever you decide, it would be a great idea to use a legitimate antimalware tool as it can help you avoid such infections in the future. Just do not forget to update it when the time comes, because it is important if you want that your antimalware tool would be able to fight the newest threats. Insert Windows installation CD and press the F8 key while you boot the system. Select Troubleshoot, once the Windows Recovery Menu appears. Choose Advanced options and select the Automatic repair option to use the Bootrec.exe tool. Insert Windows installation CD and boot your system from it. Once the options appear press any key and wait till Welcome to Setup note is shown. Press R key to launch Recovery Console. Press 1 to confirm that Windows XP is the only operating system on the hard drive. Write the Administrator password and press Enter. Type fixmbr and press the Y key, then Enter to confirm. Click Enter and remove the Windows CD when the MBR is fixed. Type exit and press Enter to restart your computer. Quick & tested solution for Mischa Ransomware removal.